on verso titled, dated 1914 by Douglas Duncan and inscribed by the Duncan estate "351" and with the Marlborough-Godard inventory #TOT 5572 and "35 I C"
In 1903 David Milne set off from Paisley, Ontario, to New York, where he would live for 13 years in Manhattan and the Bronx. He studied at the Art Students League of New York and the New York School of Art, and worked as an illustrator. It was an exciting time to be in the city, and surrounded by the crackling energy shooting through the art world, Milne rapidly evolved as a painter, and he produced an exceptional body of work in oil and watercolour. By 1913, when his work was exhibited in the pivotal Armory Show, he was considered to be an important avant-garde artist on the New York scene. 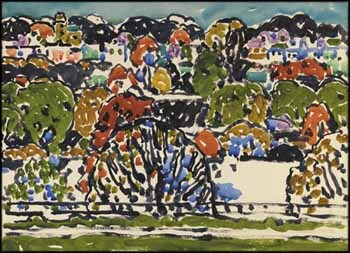 In Bronx Pattern, a vivid watercolour from this time, Milne used black in a new way - as an outline as well as a colour area, to strongly define shape. Bright hues laid down in areas and in round dabs of colour contrast with both black and the white of bare paper. In this complex, layered view of stacked streets, expressed through simplified shapes, bold line and colour, Milne shows the power of his modernist vision.